Lion King Tool Instrument CO.,LTD. 1,Closed loop of sensor Control Temperature, large power in temperature raising accuracy, and constant in temperature, no effect caused by amount of air exhaust. 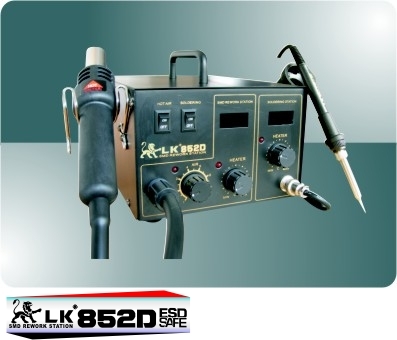 2,Special comprehensiveness of work electric voltage scope, there is perfect auto aegis system, insure in the electric voltage unsteady region that settle can. 3,Heat quick, how many seconds namely attain to use the temperature. 4,Prevent static and leakage electric to damage the PCB. 5,Use inlet heating element the type of heating element and nozzle is same as the international. 6,Can significant regulate the air and temperature, and apply all QFP and SOP type the IC to tore down to weld. 8,Assemble design, saving space and cost. 9,Be able to operation lndividually, work independence. 10,The LED shows to set up the temperature, and make operation more convenient.